A very proud creature called Xeila. I admit the boots are stylish, but the attitude is uncalled-for. 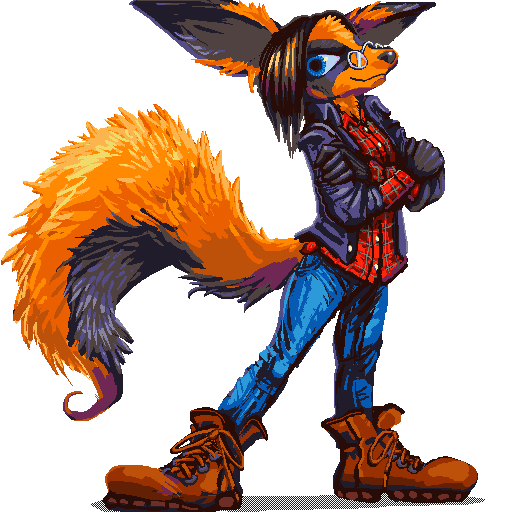 A 512x512 pixel "icon" robision for FallenFolf, hence the otherwise inexplicable image title. What we call "icons" now are bigger than whole pictures back in the day! I have not forgotten 28,880 bytes per second America Online dial-up internet and a 800x600 pixel resolution screen. And I have not forgotten that I saw a lot of those pictures when they were new. Gosh I have had a screwed up life.